Hey, you! Welcome to Stars For Stober Fundraising Drive! Every year, the volunteers of Stober's PTA spend an incredible amount of time and effort raising funds for the school for items that wouldn’t be attainable within the budget the school district provides. With the money raised last year, we were able to purchase water bottle refilling stations, Chrome Books to support the movement toward 1:1 student usage all students, teacher and staff enrichment programs, and much, much more. A new take on the Spring fundraiser! We wanted to take a quick moment to introduce you all to our new fundraiser as we’re doing things a little bit differently than we’ve done in the past. Typically, we have a wonderful gala in the spring that raises the most money for the PTA all year long. It’s kind of a big deal! It’s also a huge undertaking for the parent volunteers. It takes hundreds of volunteer hours to make it happen, so it becomes almost a full-time job for the committee. While we desperately need the funds raised by the event, every year, it gets harder and harder to put it together because most volunteers also have full-time jobs. So, how do we raise the most funds possible without all of the hours needed to pull off a big event? As a committee, we brainstormed and determined that if each family at Stober contributed $175 dollars to the PTA, we could raise the same amount we raised last year and not put the strain on the volunteer committee to organize such an event. $175 from the 202 families at Stober seemed like a goal we could accomplish! Introducing Stars For Stober Fundraising Drive! With that, we introduce the Stars For Stober Fundraising Drive: Buy a star, be a star! Our intention now is to involve every student and teacher family at Stober. We ask that between now and April 6th, everyone contributes $175 toward a star on our Stars for Stober Board. You don’t have to contribute it all at once! You can make 6 contributions of $30 between now and April for the full contribution. You can also contribute whatever you’re comfortable with. If $175 is out of reach, no problem. Every dollar counts so give what you can. Just know that if you were planning to make your big contribution in the spring at the gala, you can make it now or spread it out between now and April! In the lobby of the school, we’ll have this neat poster showing how close we are to our goal (each star is worth $175) and we will be updating the community weekly on how the fundraising is going. Between now and April, we hope to have all of the funds raised so that we can celebrate! We’ll be giving you monthly reminders and creative ideas for asking others to get involved. We’re really excited about this new idea and we all know that many hands make light work so we’re going to lean into the Stober community and spread the effort out amongst everyone who can contribute! *See below for more information before you make your donation on gofundme.com...it explains their tipping procedure and how you DO NOT have to tip gofundme. But does this mean we’re not going to have a party in the spring? Of course not! We want the party to be a celebration of our raising of the funds! Our goal is to build a sense of belonging and inclusion with the entire Stober community. We want to make this party better than ever because our hope is that all funds are raised before our event on April 6th, 2019 and the party will be the celebration of our success. We’ll be releasing more details about the party, just know it will be free for all grown-ups of our students and Stober teachers and staff. There will be food, drink, dancing, and we’ll still have the silent auction, mystery bags, and tons of fun planned. Stay tuned for more details but mark your calendars for April 6th, 2019 now! Buy a star, be a star! So do it now! 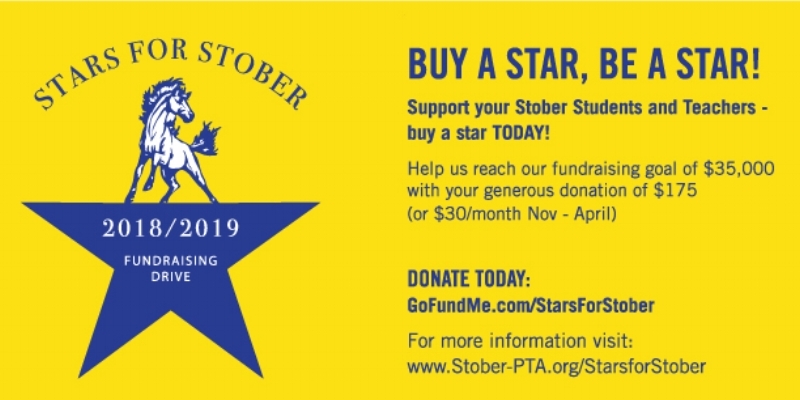 Contribute your $175 towards Stars for Stober or give what you can. * Along the way, there will be prizes for giving, we’ll get the kiddos involved, and it will be a great time. We want to spread the joy of giving to every family at Stober. Make your contribution now and remember our new motto: buy a star, be a star! *You can make your donation via gofundme.com/starsforstober or drop a cash/check off in the office. Please note that when you make your contribution via gofundme, they will ask for a tip on your donation. This tip goes to gofundme and is used to keep the giving platform zero cost for the givers of donations. You DO NOT have to tip. Please remove your tip before you submit your donation so you aren’t charged more than $175 or whatever the donation is that you wish to make.